Decals made in Great Britain. Almark decals is now out of business. Also released under the ED Models name. 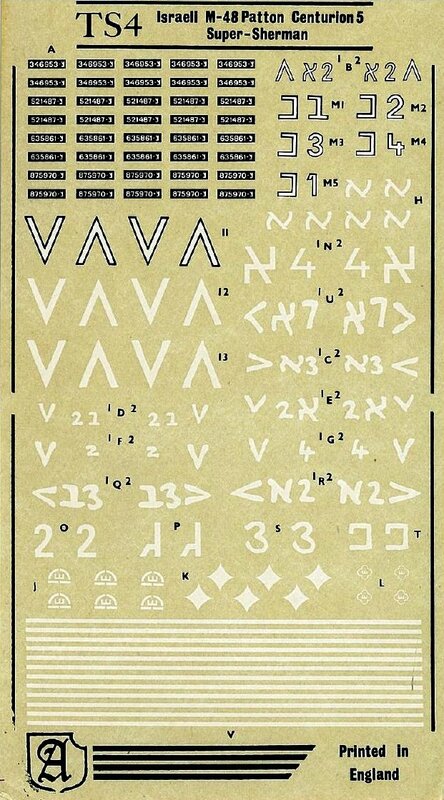 They did a series of well known and very nice aircraft decals, but we only stumbled across the AFV series by chance. 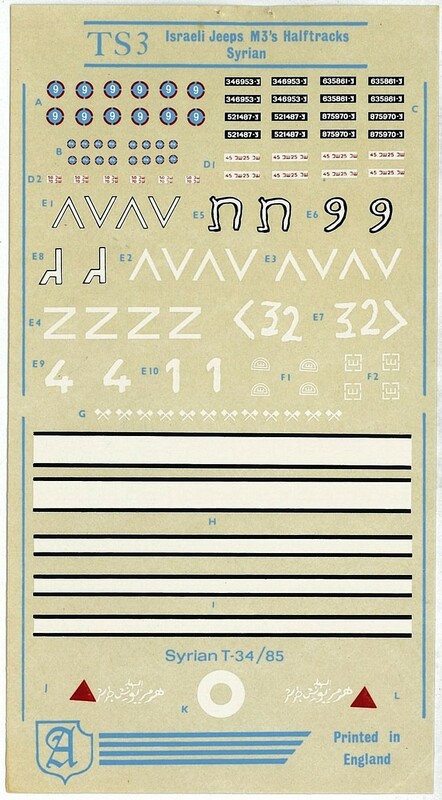 If the properties of these decals are the same as those of the aircraft decals, then they are very good, and have the nice property that the carrier film can be removed after they have dried on the vehicle by very gently rubbing them with a cloth that has been moistened with a small amount of 'white spirit'. 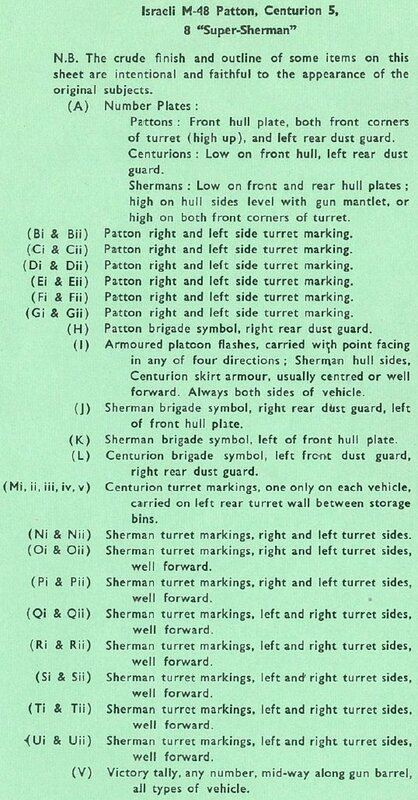 These decals are listed as 1/76, but they will more than likely do just as well for any corresponding vehicle in 1/72. What is sure is that this list is not complete. Readers with more information are kindly asked to fill in the blanks. 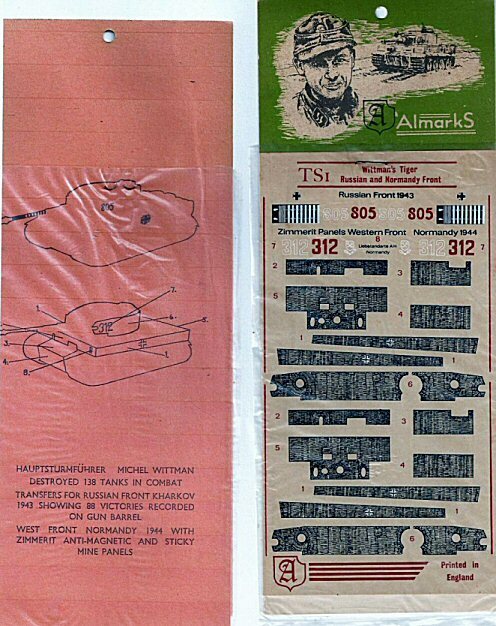 T3 German Army Crosses 1939~45 Decals 7 styles of crosses. 4 white of varying thicknesses, 2 black and white (one with rarely seen black outline), and one pure black. 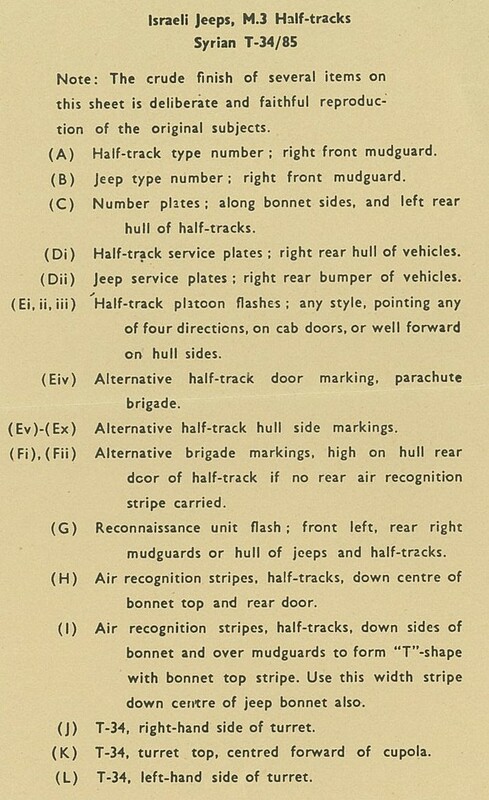 - Vehicle classifcation markings, each in yellow and white (e.g. 'towed artillery', 'motorcycle', etc.). 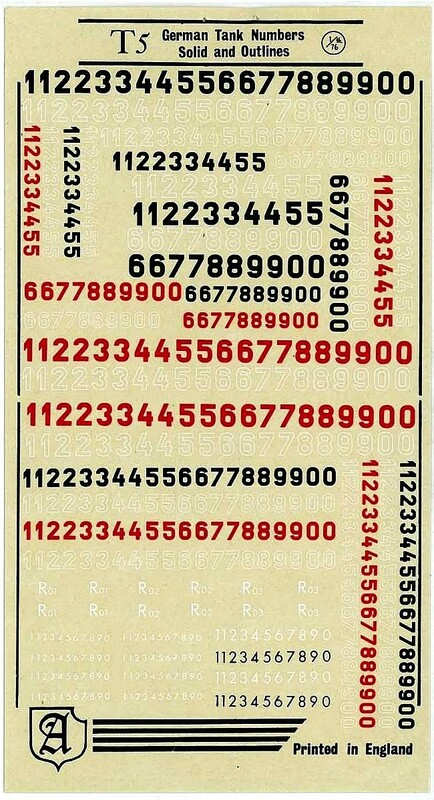 In these Almarks also includes unit markings for Grossdeutschland in yellow and white ('solid' and 'outline' style) and the "G" and "K" markings for 'Guderian' and 'Von Kleist' respectively in white and yellow. 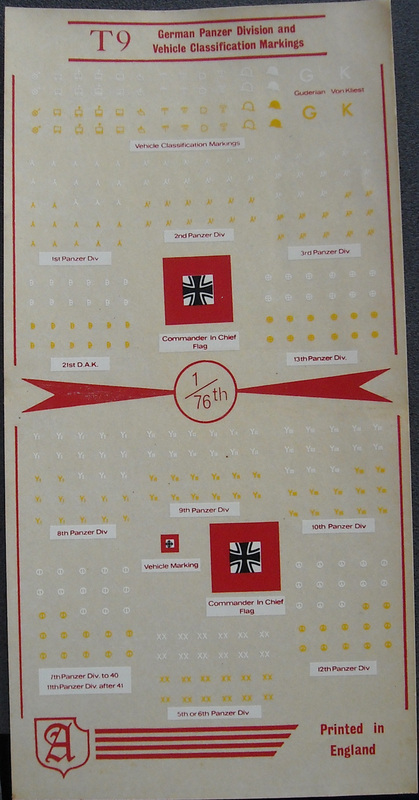 - A series of divisional markings in both yellow and white for 1, 2, 3, 5, 6, 7, 8, 9, 10, 12, 13 and 21 Pz.Div. - A series of divisional markings in both yellow (4 each) and white (4 each) for 3, 4, 5, 6, 7, 8, 9, 14, 15, 16, 17, 18, 19, 20, 21, 22, 23 and 24 Pz.Div. - SS Panzer Division Lehr [sic]. Never mind that Pz Lehr was a Heer division. - 1 (LSSAH), 8 (Florian Geyer), 9 (Hohenstaufen), 10 (Frundsberg), 12 (HJ), 18 (Horst Wessel) SS Panzer Division [sic]. 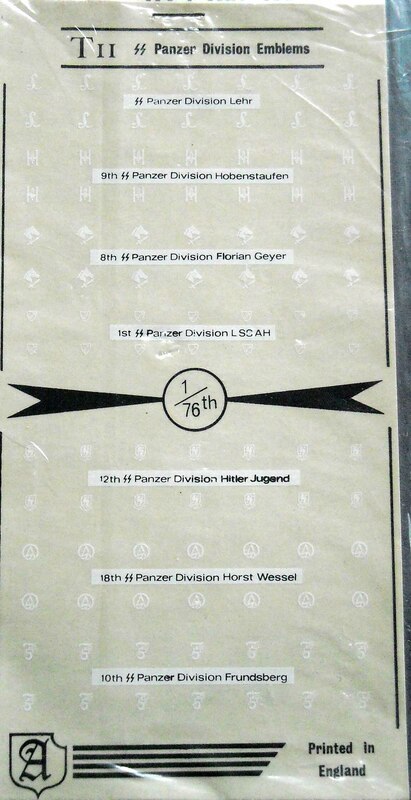 Never mind that 'Florian Geyer' and 'Horst Wessel' were not Pz Div. as such. - 8 'Airborne Divisions' squares (pegasus). - A large assortment of red stars in various styles and sizes, incl. white-bordered, yellow-bordered and with hammer and sickle superimposed. The white borders are slightly out of register. - 15 Royal Army Service Corps squares (blue/yellow). - 15 R.A.S.C., inc. HQ, squares (red/green).